BTW its not dog fights or human fights, its not even rampant snakes. I haven’t seen one in about five years and I walk five days a week in the same park in the inner west of Melbourne. The usual issues are councils not providing proper fences, snake deterrents (just in case) and adequate fresh water taps and bins and bags. The dog owners needs at parks are fairly simple, in summer they increase with the need for adequate shade and water, but proper fence security should be a council priority all year round, but its not, because they use the escape clause of ‘shared asset’ that means that humans always have priority, even in a dog park. 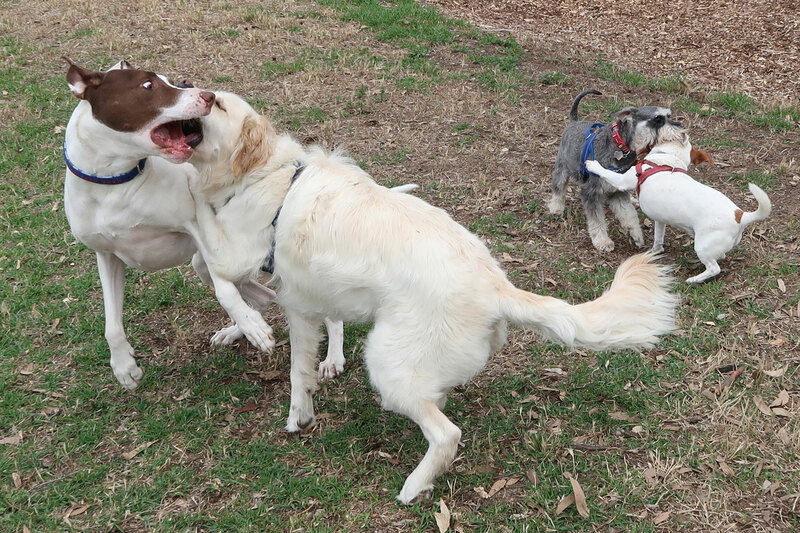 The lack of effort put into dog parks is often associated with the money not providing enough obvious improvements to the general public – the people who elect council. But I digress. melbourne dog parks are much better than many regional centre parks. I am happy to announce that due to regular and ongoing experience with dogs, that my biggest issues are mostly mundane non threatening issues. Things like one dog is dominating another dog too much and we have to discuss or physically move one of the dogs on. Perhaps one dog is straggling from the pack too much too interested in a scent or potential food find. We occasionally have to back track. Sometimes a pack of social dogs don’t realise how social they are and how anxious a first timer can be and we have to get them to introduce themselves more slowly. With a social pack of dogs it is often easier to control them than controlling a group of kids at kindy. The point being, that regardless of the occasional shock headline in media to sell papers or provide clicks, the dog park is a relatively safe place, that can often be quite mundane. However the dogs absolutely love it and gain maximum health from regular visits to it. Author: Bruce Dwyer Bruce Dwyer is a professional dog walker based in inner west Melbourne, Australia. From an original career in Electronic Engineering and Corporate Marketing he chose to concentrate on the dog service industry. His company 'Dog Walkers Melbourne' has been in business since 2010 and was based on providing the best dog walking and pet sitting solutions for people in Melbourne. The only two times that he has been away from his own dog, he has used his own 24 hour pet sitters. Copyright © 2019 Dogs Life Community Blog. All Rights Reserved.